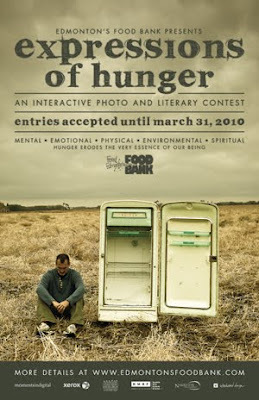 THE Edmonton Food Bank presents "Expressions of Hunger," an interactive photo and literary contest meant to raise awareness about hunger. And with the recent tragedy that has struck Haiti, we could all use a little awareness about those suffering from hunger, from our own backyard to halfway around the world. Focusing on photography, poetry and short prose, "Expressions" will break up the competition into five separate categories, in physical, emotional, mental, spiritual and environmental formats. Participants have until March 31st to submit their photo, poem or prose, and by April the entries will be posted online so anyone can vote for their top three favourites. There will be three winners in each of the five hunger categories, all of whom will be notified on May 3rd. These selections will be displayed at Edmonton City Hall from National Hunger Awareness Day (June 1st) until June 4th, and then will be exhibited from June 25th to July 7th during the Works Festival of Art and Design at the Nina Haggerty Centre for the Arts. If you're interested in submitting a piece of literature or a photo you can download the "Call for Submissions," the "Photo Consent," and/or the "Artist Licence Agreement" forms by clicking the links or visiting the Food Bank's website. Digital photo and written entries can be submitted to expressions@edmontonfoodbank.com. I Heart Edmonton will keep you updated on the "Expressions of Hunger" contest via our Twitter page, or you can follow the Edmonton Food Bank at their own Twitter page.